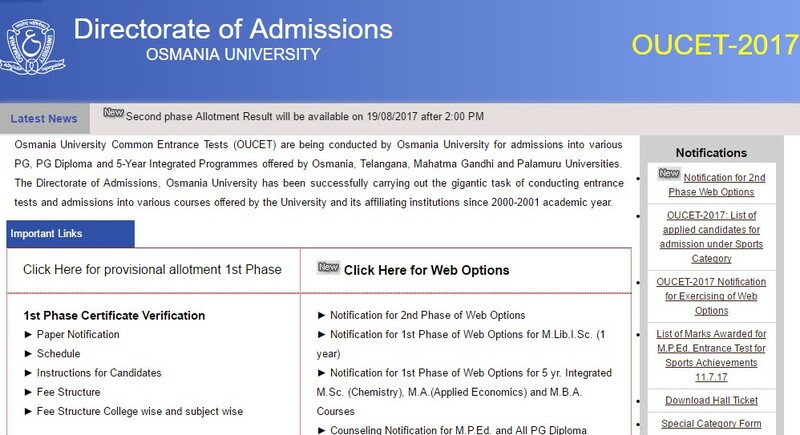 The Osmania University likely to declare the Common Entrance Tests (CET) second phase allotment results 2017 on August 19th Saturday after 02:00 pm. As per the official notification by the Osmania University, the online registration and exercising of second Phase of web options for all the eligible candidates of Common Entrance Tests were conducted from July 13th to July 16th in this year. Early, the exercising of 2nd Phase of web options for all the qualified candidates of OUCET-2017 was open between the August 9th to August 12th, 2017. The Osmania University Common Entrance Tests (OUCET) first phase Allotment Results declared on July 22nd Saturday. Check the allotment and download it. Also, it recommended that to take a print of of the allotment list. The Osmania University conducts the Common Entrance Tests every year. Because of the OUCET, the candidates who seeking for admissions into various PG, PG Diploma and 5-Year Integrated Programmes will get their admission by Osmania, Telangana, Mahatma Gandhi and Palamuru Universities of the region. Note: The Manual Osmania University Common Entrance Tests (OUCET) Counseling for admissions of 2017 to M.P.Ed. has scheduled on August 24th Thursday at 9:30 am. Also, the Manual Counseling for all other Post Graduate Diploma courses will be held on August 28th Monday at 9:30 am.